Welcome friends! Thank you for stopping by on the Winter Eclectic Home Tour hosted annually by Jess Rey from Domicile 37! Ok before we begin my holiday tour, I should probably tell you that I've recently realized something very important: Christmas décor stresses me out. Now, I'm not saying I'm a Grinch - just that I'm stressed! I know this is foolish. (My husband who's middle name is Christmas tells me this often.) Christmas is a joyous time of year! A time for family, generosity, and humility. And yet, I can't get past the feeling that our little apartment gets turned upside-down when the holiday décor comes out! So this year, I challenged myself to find a way to have my fruit cake and eat it too. We have a small apartment - a modest 800 sq.ft. The addition of a grand Christmas tree can easily overwhelm our little living space. For that reason, I tried to keep my usual décor intact and with only a few low-impact, holiday additions. I started by choosing a smaller tree this year than those we've used in the past. It's all dressed up in our hodge-podge of ornaments - many of them handmade (not because we have kids, but because my husband and I were straight poor our first Christmas). I spent hours cutting up everything from pizza boxes, old sweaters, and Christmas cards from the first year we were married. 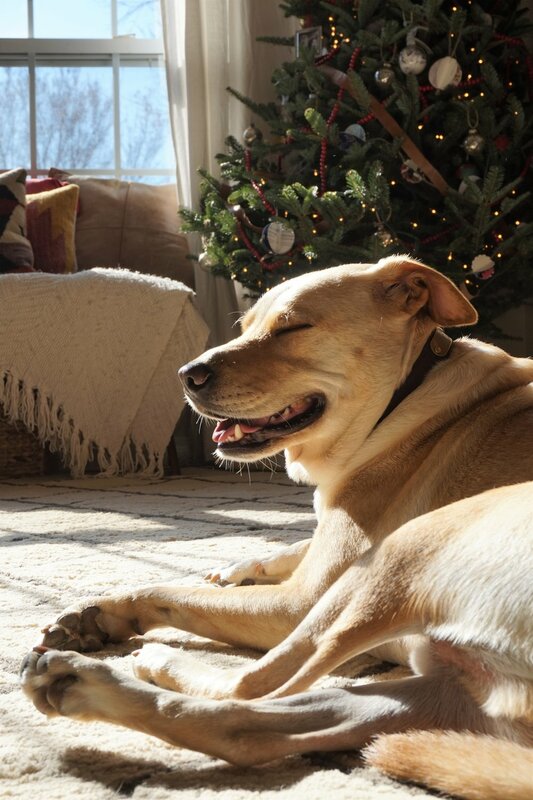 Every year, I like to read the sweet sentiments on the folds of the ornaments and remember a time that we may have been broke but we had everything we needed: each other and our then recently-adopted best dog in the world. In addition to the usual red-beaded garland, I finished our little tree with some ribbons of leather in my beloved Camel color. Behind the sofa is our little dining nook. We don't have a mantle so I hung our stockings on our chairs. Across from the living room, next to the kitchen, is some built-in shelving which is currently sporting our little record collection. This is the time of year we consistently like to have an old record on the turntable - preferably holiday classics circa the mid-century. I hardly ever show our kitchen on these tours because well… there’s not much to show. But the highlight of the space is this Moroccan boucherouite runner purchased from The Gardener's House. Each boucherouite rug is a riot of color and pattern, handwoven from recycled scraps and beautifully unique. This one is titled "Farwell from the Farm" which lends itself to more of a work of art than a rug. Perhaps one day, we'll have a bigger place and I'll hang it on the wall in the place of honor it deserves. Two staples at the end of our kitchen counter is our mail-and-key bowl (a beloved wedding gift) and the porcelain lunch bag with Thor's doggy treats. Past the whimsical grid of Matisse portraits, a few steps down the hall (like 3 to be exact), is our one-and-only bedroom. Right when you walk into the bedroom is my perpetually cluttered dresser. Pasted down from (and refinished by) my mom, it is always adorned in a tangle of jewelry and usually buried under a pile of clothes (let's be honest). 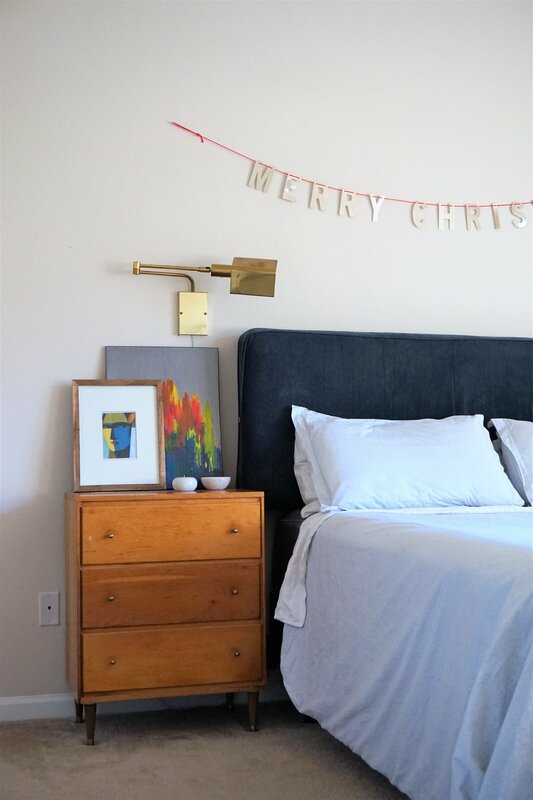 I really didn't do much to spruce up this space except add a "Merry Christmas" banner above the bed. Currently, a lot of my plants are bunking-up to make room for the visit from cousin Christmas tree. This might be another reason I get stressed - I'm never sure how my plant babies will react to the displacement. Last year, my fiddle-leaf fig tree (may she rest in peace) did NOT like getting upstaged from her usual corner and promptly let herself go just to spite me. Figadora Tonks now lives in exile - I mean on the balcony - in a corner where no one can see the incriminating evidence of my black thumb. I am pleased to report that so far, minimizing our holiday décor seems to be treating my holiday anxiety effectively... Of course I haven't started holiday shopping yet so that could easily change lol. Next stop on the tour is Jessica Brigham! 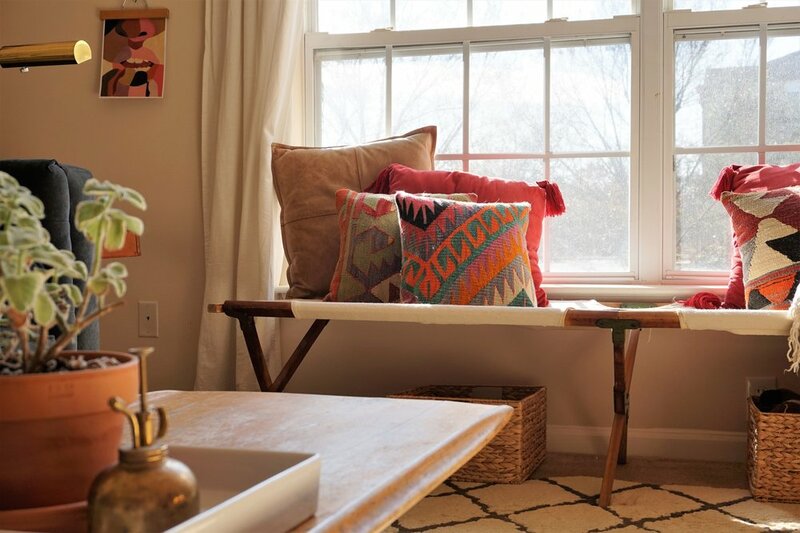 Pop over to her home for more eclectic inspiration and more directions to the last stop on today's tour circuit! Thank you again for stopping by! StyleMutt Home > Oh wait, you're already here!